Please Note that times are adjusted by 1 hour during Daylight Savings Time as the Aurora doesn't recognize DST. Get the authentic Aurora Chasers experience from the original Aurora Chasers® of Alaska. For this workshop tour, we'll take you out to one of our favorite remote locations and help you come back with incredible photos. You'll learn why we refer to it as "chasing the lights" and "Aurora Chasing" as we use multiple data sources to determine the best Aurora watching location based on Aurora activity and weather conditions. Once we determine the ideal location, we'll take you out to one of the same locations you'll find in many of our photos. If necessary due to weather, we may visit several sites throughout the night to find the best conditions. 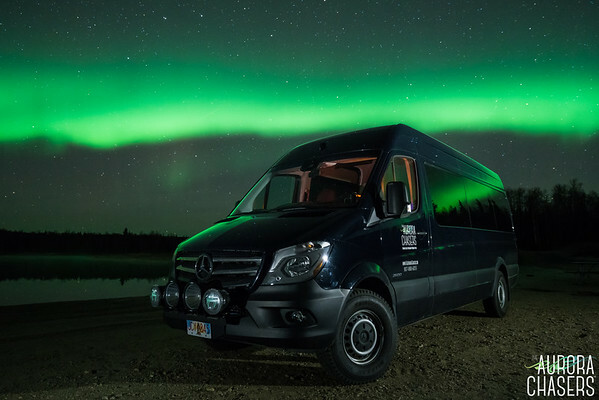 This tour is for those who want the true experience of Aurora Chasing the way we do it. That said, it is recommended that you be comfortable hiking short distances in deep snow in extreme cold climate conditions for extended periods of time as we often venture away from the vehicle in pursuit of good images. For those still wishing to join this tour that are not able to hike, you will be able to stay near the warm van if you like. Hot Cocoa, tea and Coffee will be provided but you may wish to bring along snacks and energy drinks to fuel you for the long night. Most places we go, we are out in remote locations away from amenities so please plan accordingly. Click here or the Book Online Now button above to see availability and book your tour! 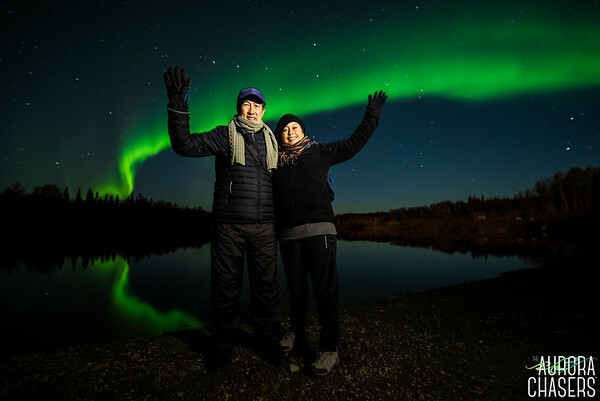 All Photography Workshop Tours are led by Ronn & Marketa themselves and include transportation to and from your Fairbanks accommodations, photography instruction and Aurora Portraits* and are single night trips. Learn to photograph the Northern Lights with true Professional Aurora Photographers. We'll demystify the secrets to predicting, finding and photographing the Aurora Borealis so that you go home with professional quality images of the Northern Lights*. Bring your camera, a bit of patience and maybe an energy drink and we'll spend an evening out under Alaska's magical night sky. We'll take you to one of our favorite locations to photograph "The Lights" and show you how to set up your gear to make stunning images of your own. We'll also make sure you go home with a few Aurora Portraits captured by us during your experience*. • A full featured camera with the ability to shoot long exposures at high ISO. Must allow Manual settings. Most interchangeable lens cameras are capable of capturing the Northern Lights in good quality. Most point and shoots and cell phone cameras just aren't there yet. If you aren't sure you have the right gear or would prefer to rent specialty gear such as "wide, fast" lenses, we now also have a limited selection of rental equipment available. • A good wide angle lens with a large maximum aperture. f/2.8 or larger is preferable. • A solid tripod with a ballhead. Don't go skimp here.This is critical! We also highly recommend one with lever locks for the legs rather than twist locks as the twist locks don't do well in the snow and cold. (We have a limited number of these for rent) For smaller, lighter cameras we suggest this one and for heavier cameras we suggest this heavy duty tripod. • A headlamp or flashlight that has a red LED such as this one. The Hefty Slider 2.5 Gallon Jumbo Storage Bags work great! • Desiccant such as this reusable one which helps to absorb moisture and keep it out of your camera gear. You can also be thrifty and start collecting the little packets that come with your shoes, electronics, etc and recycle them for use in your camera bag. • If using a Nikon D3xxx or D5xxx model it's a great idea to bring a two-stage shutter release cable. This is optional for all other cameras but if you plan to use a shutter release, be sure it is the two-stage shutter button type. We do have some of these available for rent. *Aurora and weather conditions permitting. Due to the natural elements involved and the small personal nature of our company, we have a no cancellation policy except in the case of extremely severe weather which prohibits safe travel. If such an event occurs and we are not able to take you on your tour, you will get a full refund or the choice of another tour if available. We do not cancel for cloudy skies or lack of Aurora. Both of these conditions may change and we’ve found it far easier to deliver an informative and educational experience which will prepare you for future aurora photography, on a cloudy night than to explain to you that you missed your once in a lifetime opportunity to see Aurora when the clouds cleared at 1am because we canceled at 9pm. Furthermore, while solid overcast does inhibit the ability to see the Northern Lights, anything less than solid clouds still allows the Aurora to be viewed. Therefore to give you the best opportunity possible we still go out and have a good time and do our best to find clear skies. There are no refunds or exchanges for lack of Aurora sightings as this is nature and beyond our control. However, if you do not see Aurora with us, you may go standby any night we have open seats after 8pm for up to 30 days after your initial tour. We suggest traveler’s insurance for any other issues that may arise such as illness, weather delays and other circumstances that prohibit travel on your part. Travelex has some great coverage options available.